The Falcon will be closed tomorrow through Sunday, August 16th to undergo a remodel. The renovation will include new paint, floors, furniture, and arts and graphics. It will re-open for breakfast on Monday, August 17th at 7:30 a.m.
Lottie will also close beginning Monday, August 10th through Sunday, August 16th due to construction around the Eisenhower Campus Center. The construction will be the start to the new dining hall addition that should be finished in February. Recently, a fence went up around the area to prepare for construction and crews will begin digging a hole in the next few weeks. During the construction phase, Lottie will remain open and students will be able to observe the progress. 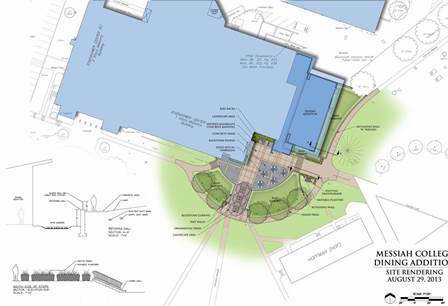 The new addition will be added out towards Hoffman and includes increased indoor seating, an outdoor alumni plaza, and eventual kitchen renovations. There will be some sidewalk closures due to the addition and combined heat and power plant project. The area along the paver walkway near the Jordan Science Center will be closed to install heat and chilled water piping to Jordan. Anyone on-campus must walk in front of Jordan, past the Community Garden, and towards the Campus Center to access the walkways from Larsen and the residence halls towards central campus. There will also be a one-lane road restriction near Smith Apartments on College Avenue. Contractors will be excavating and installing a new domestic water line into the Campus Center and installing underground brine tanks on College Avenue. Anyone attempting to access the academic buildings should use the south entrance to campus by Lenhart. The Union Café will open Monday, August 10th through Sunday, August 16th to serve work-study students and on-campus staff. During that time there will be a buffet menu and card swipe program similar to Lottie. The Union will also offer grab-and-go items and a retail menu from 7 a.m. to 2 p.m.
Beginning August 10th, the Union’s meal hours include breakfast from 7 a.m. to 8 a.m., lunch from 12 p.m. to 1 p.m., and dinner from 5 p.m. to 6 p.m.
After August 16th, the Union will close until move-in week and the Falcon and Lottie will reopen to serve work-study students and on-campus employees.